Summer means sweltering heat, especially here in Denver, where temps can tip well past three digits as tall buildings focus the sun’s rays on the pavement of our Mile High City. As you walk down the street, you’ll notice that you have to adapt to keep cool. You sweat, consuming gallons of water to keep up with your perspiration. You wear sunglasses to keep those harmful UV rays out of your eyes. You use one of those mister fans to keep your face cool (although the rest of your body is far from comfortable). And you consider taking a plunge into every fountain that you pass by. You have to work to keep cool. If oil is the lifeblood of your vehicle, your radiator fluid is, well, also the lifeblood of your vehicle. 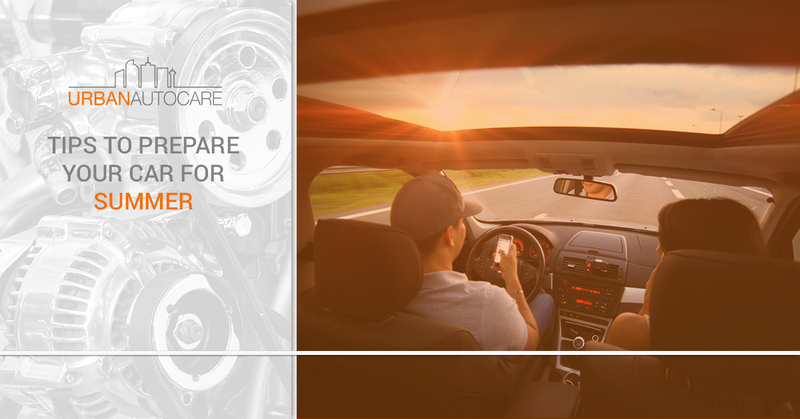 Both your engine oil and your radiator fluid work to keep your engine from overheating. Overheating an engine can cause irrevocable damage, and it’ll likely be enough damage to destroy your engine and total your car. So, take an easy step to protect your engine. Give your radiator a check. Have your radiator inspected, and have the fluid topped off or flushed. A radiator flush completely purges your radiator system of old fluid, which may contain rust and scale deposits, as well as other contaminants. If you have snow tires on your car still, it’s definitely time to swap them out. Your snow tires actually hinder the performance of your vehicle on dry summer roads, and driving on snow tires in summer conditions can actually burn through the tread on your tires. Why? Well, snow tires are usually outfitted with a softer rubber tread that’s designed to cling to ice and snow. Normal tires have a tread that’s made of hard rubber that can handle hot, textured road surfaces. Remember, there’s a reason why winter tires are called winter tires. Summer can cause your vehicle to spring a leak. Temperature changes can cause hoses and components to expand and contract throughout your engine, and that can cause a leak. Keep a keen eye on your car throughout the summer, and check underneath your vehicle for any leaks. Take note, your air conditioner will collect condensation if you turn it on during a hot day—and that’s totally normal! Look for oil, brake fluid, transmission fluid, and radiator fluid leaks. Can You Feel the Cool? How is your air conditioner performing? If your AC isn’t cutting it, you may have an issue with the fan (or fans) that pump air into your car, or you may have a problem with the air conditioner itself. You should be able to hear the fan when you turn your AC on. You may also have a loose hose which feeds cool air from your AC to the vents. Or you may have poor seals on your AC system. Your battery can be in high demand throughout the summer. And you’ll want to make sure that your battery is working as it should, or else you may be stuck getting a jump from a stranger. Your mechanic will have a voltage meter to make sure that your battery can hold a charge. You can also make sure that your battery leads aren’t corroded. If you have corroded connection points, you can clean them yourself (take caution, car batteries are dangerous!) or have your mechanic give them a scrub. Your oil lubricates your engine, and it keeps your engine cool, as we mentioned before. Like your radiator fluid, your engine oil can collect contaminants over time. That’s why it’s essential to have your oil changed regularly. Check your owner’s manual for recommendations for oil change frequency. For most vehicles, it’s best practice to have an oil change every three months or every 3,000 miles. You never know when your car is going to quit on you. So, it’s best to be prepared for the worst. Be sure to gather a few emergency supplies to keep your car mobile. At the very least, keep some radiator fluid in your trunk (AKA coolant, AKA antifreeze). Be sure to purchase a jug that’s labeled 50/50 (this is premixed fluid), or, if you purchase concentrated coolant, keep a jug of water in the vehicle as well. Take note, you’ll have to mix the concentrated stuff before you pour it into your radiator. Also, take a moment to check your spare tire (if you have one!). Make sure that your tire is pressurized to the proper psi. The recommended psi should be located on the sidewall of the spare tire, the door sticker of your car, and/or the owner’s manual. If you want to build the ultimate emergency kit for your vehicle, take a look at this esurance article: Safety First: Your Roadside Emergency Kit Must-Haves. If you’re hitting the hot roads around Denver this glorious summer. Take a minute to pull the car into the shop here at Urban Auto Care. We’ll give your vehicle a good once-over to look for impending repairs, and we can summerize your car, performing any and all of the aforementioned car maintenance services. Take a look at our full list of auto maintenance services, and when you’re ready to get your car ready for summer, get started by scheduling an appointment.